While the nation is watching the Senate take up proposals designed to dismantle health care for children, the elderly and disabled, and low-income families, the House Budget Committee finalized its vision for the country last week. Though details have yet to be released, the plan paints a gloomy future for Nebraska’s most vulnerable children and youth. The Chair of the committee promised that the budget would save the country “for our children and grandchildren,” when in fact, the budget framework breaks this promise by slashing trillions from programs for the neediest to serve the wealthiest among us. The proposed cuts are unprecedented and alarmingly short-sighted. More children will be unable to access critical preventive and life-saving care with a $1.5 trillion cut from Medicaid—an even larger cut than the House bill to repeal the ACA. Such a cut would seriously compromise health care for many Nebraska children, who make up three-quarters of all Medicaid enrollees in our state. More Nebraska children will go hungry with a $150 billion cut from the Supplemental Nutrition Assistance Program (SNAP), which would devastate the program’s efficiency by creating a block grant-type structure. Last year, SNAP lifted 34,000 Nebraskans above the poverty line and helped over 87,000 Nebraska children. [i] Today, 1 in 5 children in our state don’t know where their next meal is coming from, which is certain to rise under the House proposal. [ii] High-poverty schools will lose the opportunity to flexibly serve low-income children breakfast and lunch through a $1.6 billion cut to the Community Eligibility Program (CEP). The House bill raises the threshold for participation in CEP, affecting 5 schools with a total enrollment of 986 students that have already enrolled in the state, and preventing an additional 81 schools from participating. [iii] The budget targets an astounding number of other programs that are crucial to children, including Temporary Assistance for Needy Families (TANF), which provides cash assistance to the poorest families and funds child care, work supports, and child welfare in Nebraska; the Earned Income Tax Credit (EITC), which is recognized as one of the most effective anti-poverty programs; and Head Start, which supported over 6,500 of Nebraska’s youngest and most vulnerable citizens last year. Every Nebraskan has a stake in the future of our children and should be deeply concerned by this budget, which is a blueprint for our country to turn its back on its most vulnerable children. Will you join us in asking Nebraska’s members of the House to protect The Good Life for our state’s youngest citizens? Rep. Fortenberry (District 1): (202) 225-4806 Rep. Bacon (District 2): (202) 225-4155 Rep. Smith (District 3): (202) 225-6435 [i] Center for Budget and Policy Priorities, “In Nebraska, Safety Net Lifts Roughly 230,000 People above Poverty Line and Provides Health Coverage to 33 Percent of Children.” [ii] Voices for Children in Nebraska, Kids Count in Nebraska 2016 Report, http://kidscountnebraska.com/economic-stability/#hunger. [iii] Food Research & Action Center, “Facts: Implications of House Budget on Community Eligibility,” http://www.frac.org/wp-content/uploads/frac-facts-implications-house-budget-cep.pdf. Last week, the Food Research and Action Center released a status update on the adoption of the Community Eligibility Provision (CEP) across the country. Last year was the third school year that CEP was available to schools and districts with high concentrations of students from low-income families, and the report shows that Nebraska continues to struggle in maximizing this opportunity to ensure that hunger is not a barrier to learning. CEP allows schools to offer breakfast and lunch at no cost to all students. Instead of collecting school meal applications, schools are reimbursed for meals served using a formula based on the percentage of students who are categorically eligible for free meals due to participation in other programs. Schools that have adopted CEP have reported extremely promising effects, including increased meal participation and lower administrative costs. The data from the 2016-2017 school year show that there are significant opportunities to do better for Nebraska students in high-needs schools: Only 27.6% of eligible Nebraska school districts had at least one school participating in CEP, compared to a national average of 46.8%, and; Only 13.6% of eligible Nebraska schools were participating in CEP, compared to a national average of 54.7%. As a percentage of eligible schools who have adopted CEP, Nebraska is currently ranked second-to-last in the country. This low uptake is not for a lack of need—in fact, today, one in five children are food-insecure in Nebraska, and household food insecurity is on the rise. State aid to schools in Nebraska, as it is in many other states, is partially tied to free- and reduced-price meal eligibility. As a result, the state has sought to offer clear policy in how to address the state aid formula for schools that have adopted CEP, as recently as last legislative session. Nevertheless, the low rate of participation in Nebraska represents a missed opportunity in utilizing a targeted solution to child hunger. Sign up for our advoKID to receive updates as we continue to monitor the issue and identify barriers to CEP adoption in our state. To find out more about CEP and to find out if your school or district is eligible, click here. This week, we are joining President Obama, schools, communities, and advocates across the nation in celebrating National School Lunch Week. The National School Lunch Program (NSLP) was created 70 years ago as lawmakers recognized that child nutrition, particularly throughout the school day, was a top national priority. Most importantly, the NSLP and its newer counterparts, such as the School Breakfast Program and Summer Food Service Program, provides free or subsidized meals to children from low-income households. 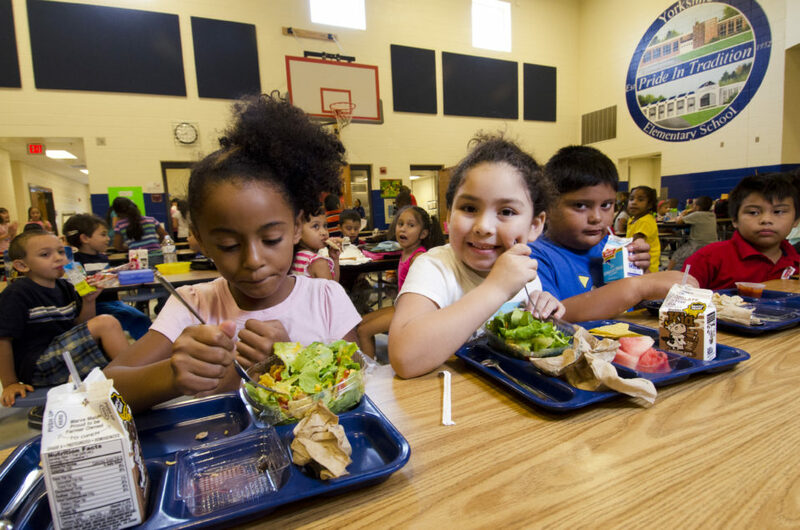 School nutrition programs, alongside other federal nutrition assistance programs, are crucial in mitigating the adverse outcomes associated with childhood hunger. Research and conventional wisdom shows that hunger is a significant barrier to learning and academic performance. There is much to celebrate about the NSLP as an invaluable fixture in Nebraska schools and communities; in SY 2013-14: Nearly 45% of enrolled students eligible for free or reduced-price meals About 90% of students eligible for free or reduced-price meals participating in NSLP Almost 2.5 million lunches served to children from low-income families Nearly $60 million in federal reimbursements for lunches served The program provides vital enrichment and benefits to schools and local communities at a relatively low cost to the state, with state funds accounting for less than 0.3% of total program funding. Federal reimbursements are higher for free and reduced-price meals served in schools, ensuring that robust meal programs exist in high-poverty schools that already face a number of day-to-day challenges. The current body of research on childhood hunger suggests that breakfast is a particularly important tool in improving behavior and classroom performance in children. Unfortunately, both the provision of breakfast in schools and student participation in breakfast in Nebraska is one of the lowest in the nation, with only about 40 free and reduced-price eligible students participating in breakfast for every 100 participating in lunch. This represents a major missed opportunity in supporting our classrooms in the state, and in the receipt of nearly $10 million in additional federal reimbursements across the state if the breakfast to lunch ratio increased by three-quarters. The good news is that there are a number of options available to schools and districts that want to increase breakfast participation for the benefit of their students. The Community Eligibility Provision (CEP), a new federal option, allows certain high-poverty schools to provide universal free breakfast and lunch to all students without collecting school meal applications. Learn more about CEP and find out if your school or district is eligible here. Howard Taras, “Nutrition and Student Performance at School,” J Sch Health 75, no. 6 (2005):199-213. Voices for Children in Nebraska, Kids Count in Nebraska Report 2015, 37. “Table 204.10,” Institute of Education Sciences, National Center for Education Statistics, Digest of Education Statistics. Kids Count in Nebraska Report 2015, 37. Katie Adolphus, Clare L. Lawton, and Louise Dye, “The Effects of Breakfast on Behavior and Academic Performance in Children and Adolescents,” Frontiers in Human Neuroscience 7(2013): 425. August means that it’s back to school season in Nebraska! As students and teachers gear up for a full year of learning in the classroom, we at Voices are turning our attention to an important factor in academic success: proper nutrition. Research tells us that hunger negatively impacts academic performance, and is linked to health-related absences, increased behavioral issues, and even suspensions. Fortunately, school meals through the National School Lunch and Breakfast Programs have long since proven to be effective and successful in keeping schools well fed and well read. Access to affordable, nutritious, and balanced meals is an important part of ensuring that children are learning in a healthy and supportive school environment. Since 2014, an exciting option to maximize school meal delivery, the Community Eligibility Provision, has been available to certain schools and districts across the country. The provision allows schools in low-income areas with high-poverty student populations to serve universal lunch and breakfast to students at no cost and without application forms. In the last year, over 18,000 schools with a total enrollment of over 8.5 million children adopted CEP and the results are more than promising. Administrators from CEP schools report increased meal participation, fewer behavioral incidents and visits to the school nurse, reduced administrative burdens, and increased program quality and viability. The success of CEP is well-known to schools and districts across the country, with 50% of all eligible schools adopting in the most recent school year. Nevertheless, Nebraska has reported one of the lowest take-ups of CEP, with only 8% (9 of 112) of eligible schools adopting CEP last year. The good news is that there is still time for more students to benefit from CEP! Schools and districts can continue to adopt CEP through the school year, and the Nebraska Department of Education is offering technical assistance to administrators. Is your school already hunger-free, or could your school be a hunger-free zone? Find your school or district in the most recent notification of eligible schools and districts in the state. Last month, the Improving Child Nutrition and Education Act of 2016 (H.R. 5003) advanced from the U.S. House education and Workforce Committee with markups that would significantly change national child nutrition programs for the worse. As this year’s child nutrition reauthorization was being considered by the Committee, we proudly joined 750 other organizations from across the nation to oppose its harmful provisions. Access to healthy and nutritious food is crucial for children. Research shows that hunger and undernutrition is detrimental in all stages of child development, and can result in lifelong consequences on cognition, physical and mental health, and overall well-being. Unfortunately, child hunger is on the rise here in the nation’s breadbasket—last year, 1 in 7 Nebraska households didn’t know where their next meal was coming from. Wednesday will mark the final day of this year’s legislative session. Voices for Children will post our full legislative sine die in the next couple weeks, but for now, we’d like to take a moment and highlight five victories for Nebraska’s kids: Schools in high-poverty neighborhoods can take advantage of a federal program to feed more children, without fear of penalty. Children learn better when they aren’t hungry, and in 2014, the federal government instituted a program called the Community Eligibility Provision that reimburses high-poverty schools for providing free and reduced lunch to all enrolled children. Nebraska currently ranks second to last in state take-up of the program. Important statutory changes were passed in LB 1066 this year to ensure that schools choosing to take up community eligibility aren’t unfairly penalized. We hope with these changes, more of our schools will begin to offer free and reduced meals to all kids! We all want kids to succeed in the classroom. This week, the Legislature has the opportunity to fuel students’ learning by making more Nebraska schools hunger-free zones through LB 1066, which would include provisions of LB 1004 and LB 1065 through a committee amendment. The underlying bill is the annual technical bill for education in Nebraska, and through AM 2640, would make important changes to allow more schools to take advantage of the federal Community Eligibility Provision (CEP). The CEP allows schools in high-poverty areas to serve free breakfasts and lunches to all students. Research shows that universal school meals increases meal participation and improves overall health and nutrition for students. Today marks the 9th day of the 2016 Nebraska Legislature, and this year’s short 60-day session promises to be an important session for kids and families in our state. In the coming months, the Unicameral will consider many bills impacting child well-being in the areas of child welfare, economic stability, health, and juvenile justice. Throughout the session, we’ll be bringing you updates on the measures that will affect Nebraska’s children and families the most and let you know what you can do to help.